When would you like to upload artwork? Give guests an elegant reminder of your wedding date. Announce you and your future spouse’s wedding date with the elegant shimmer of metallic save the date cards. You can apply the metallic accent on a wide variety of colors, which customizes your wedding card design. Your size choice will depend on the impression you want to make with the wedding card. 4.25" x 5.5" is the most popular size as it can be mailed as a postcard. It has enough space for other important details such as the venue and RSVP contact. 4.25" x 6" is slightly larger than the previous size and provides more space for other decorative elements such as a metallic border. 5" x 7" is a vertically-oriented size that works on typography-based or minimalist designs. You can also have a couple photos as the background. 5.5" x 8.5" works best on wedding invitations with a horizontal background image. Use the extra space for other details or have a plain colored background contrast the metallic text. 6" x 6" is our largest size available. Typography-based designs normally utilize the space for lengthier details and additional decorative elements. You can also include an envelope that matches the size of your save the date invitations. Enhance the metallic elements with an understated background, a glossy surface, or additional high gloss areas. Uncoated surface gives the invitation a rustic, classic touch that further emphasizes the shiny date or couple’s name. High gloss UV applies an extra shiny gloss to the rest of your wedding invitation cards. Its high reflectivity adds an extra festive feel to your announcement. Spot UV printing can be applied to specific areas of your design. Apply this on crucial information such as your venue or date. The varied texture calls attention to what guests need to know. 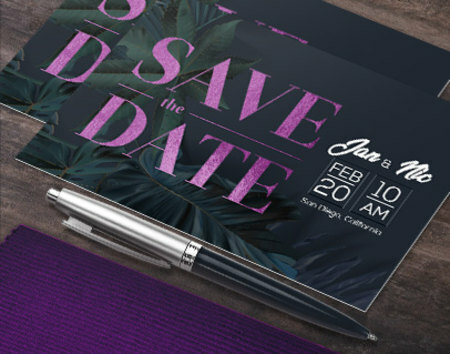 All save the date invitations are printed on premium 16 pt. cardstock, which is our thickest and most durable material available. Design Note: Use a minimum font size of 7 or 8 pts. on spot UV text. All border and stroke portions must be above 1.5 pt. and a 1/16” gap must be placed between the metallic foil elements. Upload your metallic save the date cards design today or download one of our templates to get started. Our print experts are available for any questions or clarifications. How should I prepare my metallic save the date card for printing? You will need to submit 2 files: the full-color, CMYK file and the silver foil mask file. The foil mask file indicates the areas with metallic printing. Apply 100% K or black to the metallic areas, while the rest is colored in white. How should I prepare the file for spot UV printing? Similar to the foil mask file, a spot UV file is submitted along with the CMYK one. The spot UV areas are indicated with 100% K or black, while the non-spot UV areas are in white. The printing turnaround refers to how long it takes to produce your order. This is different from the shipping time, which starts after we've printed your order. To find out when your order will arrive, input your ZIP code after selecting “Get Shipping Estimate” on the online calculator. Download the layout template below for your metal save the date cards dimensions. It will help you verify that your artwork meets all of our guidelines. This means checking if your text fits inside the caution zone and your design bleeds to the paper’s edge. Follow the specifications provided so you can be sure your artwork prints correctly. You can download PDF, EPS, JPG, and Publisher versions of each layout template. Need help with our layout templates? Please refer to our guided layout instructions. Customize metallic wedding cards according to your style or story as a couple. Stick to a color palette. Apply the colors particular to your wedding palette. Use one or a few graphics so that the important details (like the date!) are easy to read and find on the save the date card. Focus on words or a central image. Use typography or word art to reveal the date and location of your wedding. Or, you can place a couple shot as the background and then overlay the metallic text. Use icons or location-based imagery. Have a spot UV or metallic map showing your wedding location. Use an icon that represents your love story. Create a skyline of the city you both reside in or plan to live in. Link to the configuration you have created. When using more than one address, separate them with commas. Your email quote has been sent. Thank you for using PrintPlace.com!